Here we are, finally made it back after that last time warp of November 2016. Times change and so did my layout. My last grandiose layout plans came unglued at the hinges for a myriad of reasons, not the least of which was my over ambitious dream list of what a first layout should be, seeing as how I haven't been doing this model railroad gig for over 40 years. So I hunkered down and regrouped, read Lance Mindheim's books about shelf layouts again over the winter and decided that perhaps a smaller more manageable shelf layout in which I can actually complete all stages of construction might be in order. With that in mind I cobbled together a shelf layout that measures 20 inches wide by 30 feet in a more or less U shape configuration. 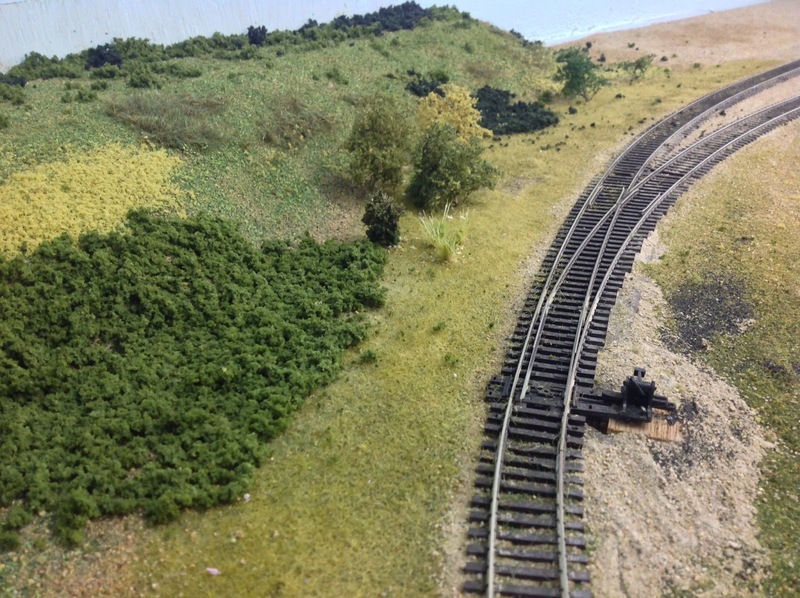 Track consists of one meandering rural line and a small siding. 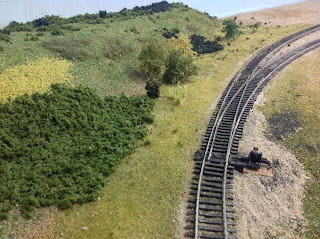 The final track plan may well end up getting revised down the line, but for now I wanted to move onto other facets of the hobby....electrical, scenery, weathering, structures etc. I want to complete this layout and try a whole bunch of different methods for scenery, so I can get a feel for what others have done and see what works best for me. So the overall cohesiveness of the layout , especially the scenery, may not jive 100%, but that's OK. This will be the guinea pig test layout for the next one,if I like it enough to keep going... ;). 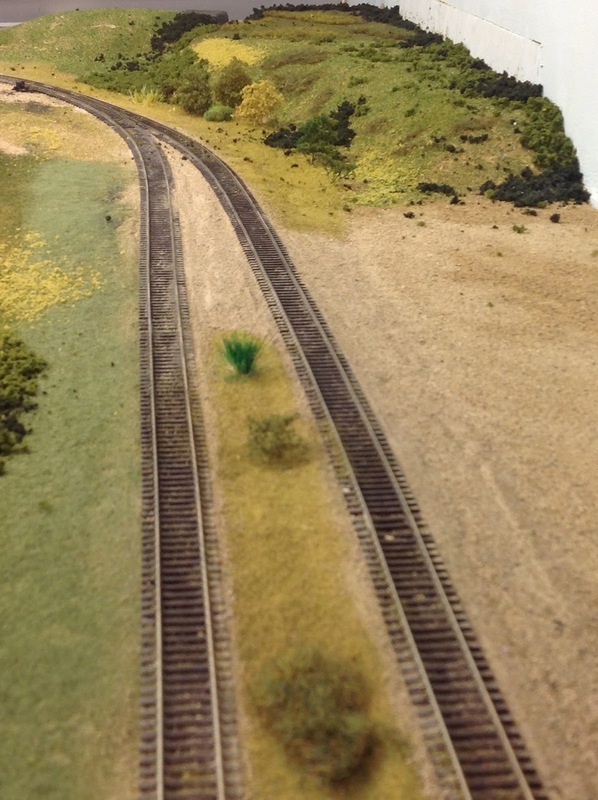 At this point, the track is down, weathered and ballasted. I used fine sifted sand and glued it all down. The wiring underneath the layout for DCC is for the most part done. Main bus line and feeders hooked up. 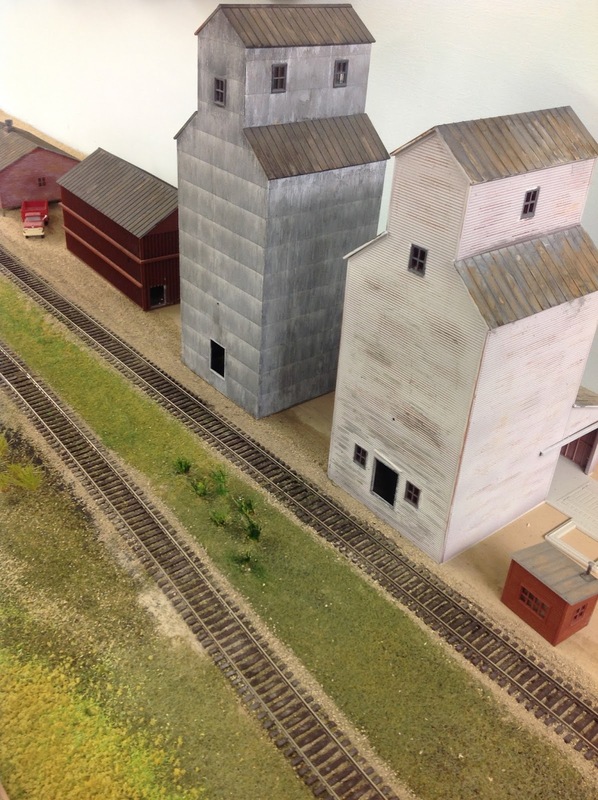 Structures will consist of a couple of elevators and some smaller buildings suited for a backwoods rural theme. I haven't cobbled together anymore structures as yet, other than the two grain elevators I built over a year ago. My focus right now is on the scenery. 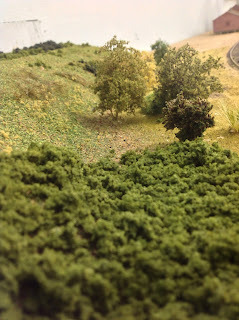 Applying ground covers, small elevations of styrofoam, small shrubs and grasses and of course trees. 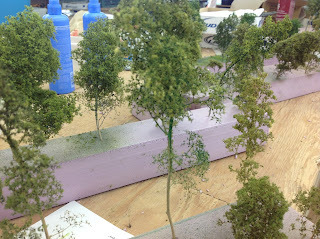 Some of the scenery was homemade and some stuff bought. 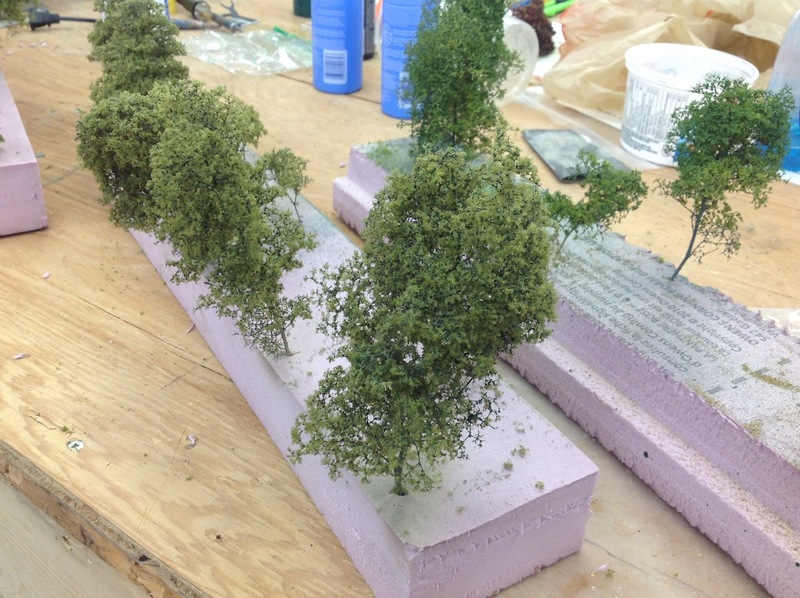 Using a lot of woodland scenics ground foam, fine and coarse turf and static grasses. 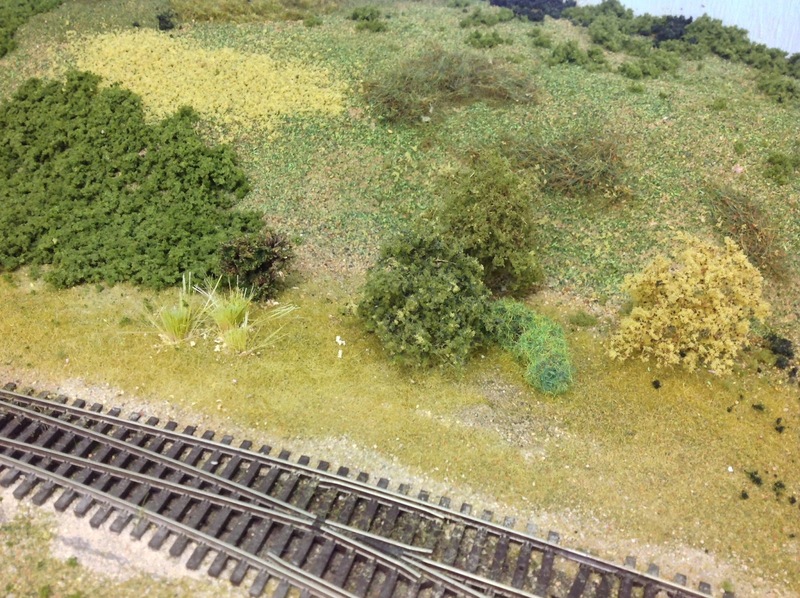 Been trying to source my supplies locally when I can, however as of late I have been obtaining most of my scenery stuff from Otter Valley Railroad and Credit Valley Railroad in Ontario. Cheaper than local and delivered right to my door. Part of the problem with buying local is that 95% of the time they don't have the stuff in stock and have to end up ordering it in and wait several weeks. I can do the same thing, cheaper, faster and all around less hassle. My take on it is that a lot of these bricks and mortar places are just shooting themselves in the foot the way they are running their show. If you can't at least stock basic scenery supplies, that apply to all scales, I dunno, I just don't get it. And then they cry foul that no one is patronizing their business. Rant over. For about $15 I built my own static grass applicator. It needs a little tweaking but it's just about there. Beats paying $200 plus for the retail one. And trees.....trees are ridiculous if you want to buy the commercial stuff. Not very realistic and pricey to boot. So I did a little research and made my own and I think they turned out just fine. They are still a work in progress as I fine tune the 'leaves' and colour hues, but I'm slowly honing the tree crafting art. So that's where I am at to this point. And so far..it's fun. Here's hoping the next post won't be 5 months down the line. Hey Steve....thanks. I'm afraid the operating session would be very, very short. Not sure how much more I will get done for this model railroad season. Once the warmer nicer weather gets here, I'll be outside in the garden and yard. Thanks for stopping by. Cheers. Hey Glen - nice to see you back! Great looking scenery - I have just started on my own but am nowhere near making my own trees yet! Hi Gary........thanks. Hope to get this mini layout done to completion and then we'll see where we go from there. Busy making trees now. Going to do a follow up post on that shortly. I see you're doing well with your layout, I'm following along. Thanks for stopping by.